Need some quick cleaning? Then, try these tips and tricks for your home, or let our cleaners show you how it’s done. And have a clean home in no time! Although, you can actually try and give those DIY’s that you can find online a shot. But try and hear out the insights from cleaners first. They do it professionally after all. Here are 9 best home cleaning tips and tricks that work. Any tasks are difficult and complicated without the right knowledge to do it. But thanks to the great minds that brought us the internet. 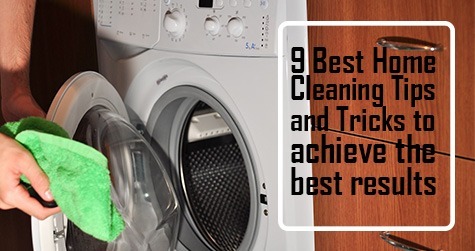 Best home cleaning tips are everywhere over the internet. Now, the challenge is the part where you decide which of them actually offers the best results. Well, a word to the wise? Listen to the ones who actually have the experience and competency for the task. You’re at home. If it’s an emergency, people can simply ring your landline. That is if they really need to contact you. Ergo, there’s really need to keep your phones up while cleaning. It will only offer you distraction, causing you valuable time. If you really need to clean as fast as you can, then don’t forget this best home cleaning tips and turn the phone off. Okay, now that you’re all set. Time to get to business. This shouldn’t be your first time being in this dilemma, or is it? If you already been here before then all the better. You will be able to assess more efficiently which ones are the easy tasks and which are the hard ones. After your assessment, start doing the easy ones because if you start with the hard tasks, then, you may end up finishing fewer tasks than what is required to a house that is “tidy enough”. Whatever that means to you, this best home cleaning tips should be straightforward enough eh? When you get to the part where you use the dishwasher, try being innovative. There are plenty more ways to take advantage of its automation than what you may expect. You can clean more kitchen wares than usual as long as its ceramic, metal, glass, or plastic and it fits, then it’s cool! It’s difficult to reach through the tricky areas of the microwave. Would help if you can soak it in water, would it? But no! You can’t do it that easily. Gladly, there are more easy alternatives too. Get a cup of water and put it in your microwave. Then turn it on for 2-3 minutes. And voila! You will find the residue molten and easy to wipe through. Now, when you deal with the specks of dust all over the house. Make sure to clean from the top to the bottom. Especially if you are dusting. Make sure to dust your curtains first. Then the chandelier, lamps and everything else that is elevated and accumulates dust. Before you begin sweeping the floor. For an easy one way clean. Instead of going back to square one in sweeping the floor. Or worse, cleaning the carpet all over again. Although, as a better alternative and if messing the carpet is really inevitable. Maid in Perth recommends Carpet Steam Cleaning services for a more extensive carpet cleaning. If you are running out of time. Then forget about cleaning the whole house. Be realistic. You won’t really be able to clean it all now. So, skip the rooms that are rarely used. Focused on the ones where your guests would actually visit. Don’t worry you’ll find time later. Your weapons of general cleaning are your best aids in cleaning. So, whenever you get the chance, do some maintenance work on them or find someone who can. Might as well let dad do it. Your tub and showers will never get that dirty if its cleaned more often. Let everybody do you a favour and make them clean after themselves. This will save you lots of time. Although, you can’t expect genuine optimism from everybody for that. These are only some of the best home cleaning tips that you can get from a professional cleaner. But do you know the best cleaning tip is? It’s hiring professional cleaners. Cleaning is what they do best. If you know where to look, you can actually find great deals in acquiring their services. Most especially if you hire our cleaners in Maid in Perth. You’ll have the assurance of the bests cleaners in Perth. Need more of these tips? Stay tuned for more posts and news on our blog. You can visit our services pages or might as well talk to our consultant to book your appointment. Curious why the need for professional cleaners is on the rise? Well, get your answers today. Read our previous post Hiring Home Cleaning Services. This entry was posted in Home Cleaning and tagged cleaning tips, home cleaning services, maid for you, Maid in Perth.